A big part of understanding where to start to improve your conversion rate is to get a solid understanding of what is working and not working on your site. Google Analytics is a good start but it is often too general unless you have set up detailed on site event tracking. On IronPlane.com we have been using Hotjar lately. Hotjar lets you see where people are clicking on your site. It can be eye opening to realize that the amazing graphic you designed is never once seen by any of your visitors. 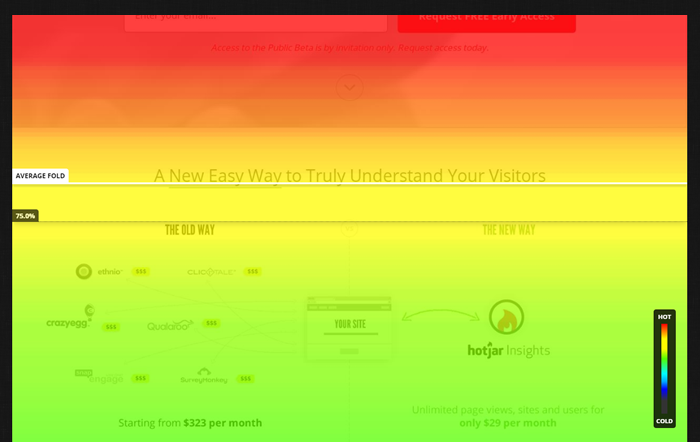 We used a scroll heat map (see below) on our site for a while and realized that no-one was scrolling below half the page. We have since made some modifications which has improved scrolling but still it is clear that even with these changes, key calls to action need to be placed higher on the screen or always present with a persistent header. There are other services like Hotjar, but we found this one easy to use and reasonably priced. The free version may even work for most. We have an agency plan with Hotjar. If anyone needs help with this let us know. Next newsletter will be the Monday after Thanksgiving. On behalf of everyone here at IronPlane, have a wonderful Thanksgiving! Excellent customer service – It takes almost no time to get someone on live chat to answer those pesky questions that come up. Magento – if you are running a Magento shop, Dotmailer should be a clear contender. Beyond being a premier partner of Magento, it is natively integrated at a deep level. This makes personalization, re-marketing, abandoned carts etc much easier. Do want another entry or two in the Sea Bags Giveaway? We have added a few share/follow entries for Dotmailer. Time is running out to enter to win this month’s giveaway! The current prize is a blue anchor tote from Sea Bags. Sea Bags, a client of ours based in Maine, creates bags and other accessories using recycled sails. This giveaway ends on November 22nd so be sure to click the link below to enter to win. There are many different ways to enter so be sure to get all those entries in to maximize your chances. Good Luck! Heat Map – A heat map is a two-dimensional representation of information with the help of colors. 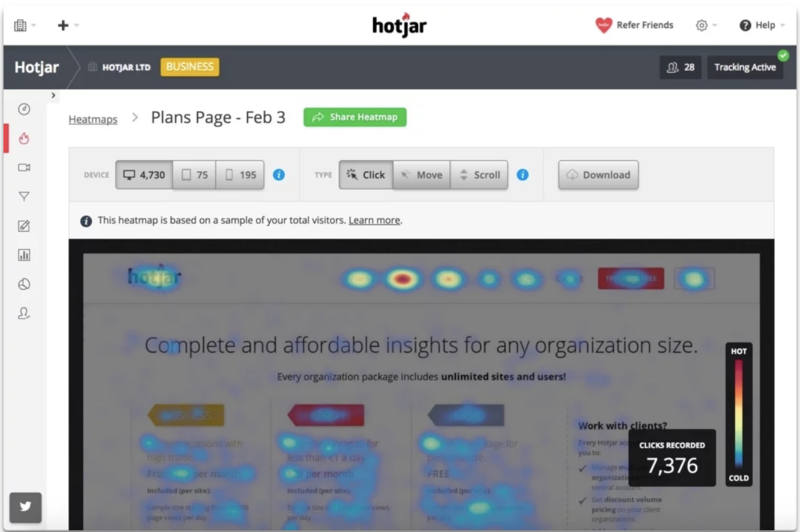 Heat maps can help the user visualize simple or complex information. The varying intensity of color indicates where most of the clicks occur. The first example is a scroll heat map which shows how many people scroll down the page. The second example is a mouse click heat map. How far do people scroll – It certainly depends on the type of page, industry, etc. However, it appears that more people are on average scrolling past the fold now versus past years. Nielsen Norman Group reported that 57% of page-viewing time is above the fold. 74% of the viewing time was spent in the first two screenfuls, up to 2160px. This is a change from 2010 when 80% of page viewing time was reported above the fold. If you think you know the answer be sure to enter our giveaway above. The right answer will earn you an extra entry! Next week we will share the answer along with a new riddle. Last Week’s Answer: Did you guess the answer to our riddle from last week? The answer is “the carnival worker wrote “your exact weight on the paper” so he won the bet! Web development is changing every day, driven by user expectations, design trends, new frameworks, and a host of other factors. Users expect an intuitive and easy experience that is fast and accessible from any device, anywhere in the world. In today’s business environment, brick-and-mortar stores are losing customers daily to eCommerce ventures. With 24-hour shopping available, the ability to reach out to an international customer base as well as easy, speedy access to an almost infinite array of goods and services, both customers and entrepreneurs see the value of eCommerce business ideas. B2B sales are huge and growing: in 2017, B2B businesses earned $7.7 trillion. If you don’t already have a B2B eCommerce strategy in place, you might be losing out on the B2B boom. Global B2B eCommerce gross merchandise volume (GMV) grew from approximately $5.8 billion in 2013 to about $7.7 billion in 2017, and studies estimate that B2B eCommerce will top $1.1 trillion by 2020, accounting for more than 12% of all U.S. B2B sales. Having a user-friendly, well-functioning B2B eCommerce site is therefore a critical part of doing business. Paying attention to the latest eCommerce trends can help keep your business on the forefront of consumer activity and growth. Here are some of the most important trends to watch in the coming year. IronPlane fine crafts eCommerce solutions by helping each individual client find the right investment balance in technology to maximize returns. A full service agency, we have the expertise and resources to assist with migrations, upgrades, new site builds, ongoing support and maintenance, and Magento-optimized hosting.